Eish, how I’m I even supposed to review this as a book? Madness! Okay, my dramatics aside. Your Heart Will Skip a Beat and Other Stories is clearly an anthology. 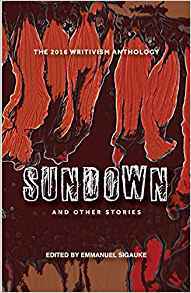 A flash fiction anthology of 13 stories by brilliant writers so technically speaking, I can’t talk about it as a whole, right? Or maybe I can. Before I get caught up in my gibberish, my favorite stories are ‘The Kind of Water I Like‘ by Lillian Akampurira Aujo and ‘Tomorrow’s Burden‘ by Uzoma Ihejirika. The thing about reading an anthology is that you don’t get time to ‘recover’ from one story to another. I shall speak for myself though. I did read it all at once and I kind of can’t find my bearings right now. So if you haven’t read it yet, I advise you take some breaths in between the stories. Take as much time as you need to properly move on. I’m serious by the way(just in case). There is no way(that I can think of) I am going to break down all the stories and not spoil for you…but let me try. ‘Justice‘ made me really angry. A righteous kind of angry. I even felt dead at the end of it. The sudden change of events took me by surprise, which is a good thing…but not a good thing. Ah, I’m itching to narrate the story but you’ll hate me. I was still trying to get over myself when I read ‘Overcome‘. I think writers are some of the most cruel people walking this earth. The story ended as soon as it started and no, I was not feeling better. I was actually hurt by this one. Why? Why do writers do these things to characters? It’s not fair. ‘Aduke’s Waist‘ placated my mood. I actually managed to laugh. It’s funny. I hope I have a normal sense of humor though, you know, if someone else could please agree with me on this. It’s funny, right? And then ‘The Miners’ is that story that jumps at you and then just disappears. Does that make sense? Yes, of course it leaves with you with questions. Don’t read it before going to bed, or just sleep with the light on. Or maybe I’m just inciting non-existent fear hihi. I can’t know for sure, but those are my sentiments. ‘The Kind of Water I Like‘ is my favorite story, not just because it’s Ugandan(I really need to stop with this ), but it really really warmed my heart. The ‘awww’ kind of warm. *wipes tear. I think seeing some things only on the news makes them seem so far off and stories like these, personal stories, bring the realities closer and paint a more realistic picture. Suddenly it’s not just another feature at 9’o clock. A man has got to do what a man has got do. That is the law of the jungle and Lagos is the jungle in ‘Lagos Doesn’t Care‘. I laughed so hard at the end of this story, mostly at how absurd it is. Life is hard people, life is hard. I literally clutched my tummy throughout ‘The Convenient Doctor’. Good God, isn’t it vivid?! Another favorite of mine ‘Tomorrow’s Burden‘ also had me ‘aww’-ing. Never mind that is not a word. It had me on the edge thinking ‘just do it’ but sadly characters don’t listen to readers . Why are human beings like this though? ‘Your Heart Will Skip a Beat‘ left me conflicted. ‘Same Size Feet‘ is also another story not to read before bed. It is so emotionally draining from the beginning to the end of it. It made my heart so heavy and ending the book with ‘Juliet‘ didn’t make it any easier. Your Heart Will Skip A Beat is published by Bahati Books and is available as a free ebook.